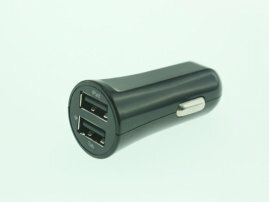 Extreme High Power Dual USB Car Charger for iPads / Galaxy Tabs [OC002413] : Onchee.com - the accessory shop for all your handheld Electronics! This is probably the slimmest dual USB Car charger in the world! It measures 62 x 26.8mm only. It provides a 2 high power USB sockets, both are capable of output 2.1A for new high power usb device, e.g. iPad, Samsung Galaxy Tab... It means you can get 2 high power usb devices charging at the same time! - High power USB Power for iPad to charge the iPad quickly.